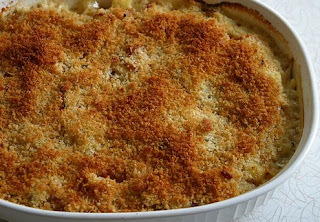 Indian Summer Gratin - Okay, so technically summer is over. 'You could have fooled me! ' Here in the South, summer is still hanging on for dear life, and it seems everybody is at a loss to what to cook. 'When I saw the title for this recipe, it immediately jumped out at me and I knew it would be a gentle way to finally kick summer to the curb. 'Summer? Are you listening? 'You were great this year, you really were. 'But let's just quit with 90's already. 'It's Fall. There is something about that first chill in the air that brings the biggest wave of nostalgia. 'For me, fall always reminds me of the giant piles of leaves from our maple tree in the back yard. 'Many afternoons after school were spent raking up the leaves and my braver brothers climbing the tree and jumping into the pile. Growing up in the Midwest, I also knew that fall was achingly short. 'Part of what I love about living in the South now, is that fall is truly a season. 'It's still shorter than I'd like, but I am able to appreciate it a bit more. 'Well, that is, if we weren't expecting a high of 96 on September 23rd. I've always been pretty terrible at description of anything, let alone food, but I will do my best. 'I am generally not a detail oriented person, but I am also lacking in creativity in certain areas, so I do need instructions, though I allow myself to bend the rules a bit. 'Unless you're building Ikea furniture, in which case just follow the instructions and put those tables and that chair together while your husband is out of the house. 'Girl power! 'Oh, but back to the food. 'Okay, I liked this dish quite a bit because well, I really love squash. 'I felt all the other ingredients were such a great compliment that while the butternut squash was still front and center, it wasn't overpowering. 'The bacon gives it the salty-sweet contrast, and the cream gives it a great cohesive depth and richness that is so necessary for these cooler weather dishes to really be satisfying. You know when you make something for the first time and you know that it's going to be a part of your life forever? 'For me, this is one of those. 'This is totally the thing to make when guests come over (either as a side or a main dish). 'I like it because it's just a little bit surprising but still familiar. 'This is a great make-ahead dish as it reheats well and tastes even better the next day. 'If you live somewhere that it has already started cooling down, this will be a very welcome recipe, but even for us still sweating it out, it's still something to make now, and maybe again in a month. The only two things I changed were that I used a little bit more bacon, which probably I don't need to explain why, and also I used frozen corn because I have a lot of it in my freezer right now. '(This recipe could easily be made vegetarian by omitting the bacon and using vegetable stock.) For many of you, this probably doesn't need to be said, but for the rest of us who are still learning their way around the kitchen and how much time it takes for us to chop things, I highly recommend pre-chopping/grating/zesting/measuring everything you will need before you even start cooking the bacon, that way once you start you can just move right along. 'And please be careful cutting that squash. 1. Position a rack in the center of the oven and heat the oven to 400 degrees Fahrenheit. 'Rub a 2-quart shallow gratin dish with 1/2 teaspoon of the butter. 2. In a 12-inch nonstick skillet over medium heat, cook the bacon until crisp, about 8 minutes. 'Transfer the bacon to paper towels. 'Reserve 2 tablespoons of the fat in the skillet; discard the remainder. 'When the bacon is cool, crumble or mince it. 3. 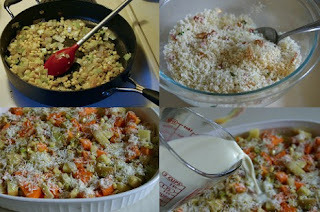 In a small bowl, combine 2 tablespoons of the crumbled bacon with the breadcrumbs, 2 tablespoons of the Parmigiano, the olive oil, 1/2 teaspoon of the thyme, and a large pinch of salt. 'Mix well. 4. Add the remaining 1 tablespoon of butter to the skillet with the bacon fat and melt over medium heat. 'Add the leeks and a pinch of salt, and cook, stirring, until softened and just starting to turn golden, 6-7 minutes. 'Add the garlic and stir well, then add the corn, 1/4 teaspoon salt, and a few grinds of pepper. 'Cook, stirring, until the corn has lost its raw look and is slightly shrunken, 2-3 minutes (4-5 if you're using frozen corn). 'Cool slightly. 5. Combine the cream and chicken broth in a 2-cup liquid measure. 'Add the lemon zest, 1/2 teaspoon salt, and a few grinds of pepper. 'Stir to mix well. 6. Add the remaining bacon, the diced squash, the diced potatoes, and the remaining 1 teaspoon of thyme to the skillet, stirring to combine. 'Spread the mixture evenly in the gratin dish. 'Sprinkle the remaining 1/2 cup Parmigiano on top. 'Stir the cream mixture one more time, then pour it over everything as evenly as possible. (Be sure to scrape out any seasonings left in the cup.) 'Press down on the vegetables with a spatula to that the liquid surrounds them and everything is evenly distributed. 'Sprinkle the breadcrumb mixture evenly over all. 7. 'Cover with foil and bake for 20 minutes. 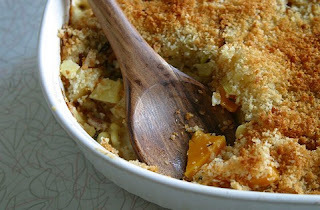 'After 20 minutes, remove the foil and continue to bake until the crumb topping is deeply golden and the squash and potatoes are tender when pierced with a fork, about 25 minutes (only took mine 20 minutes). The liquid should have bubbled below the surface of the vegetables, leaving browned bits around the edge of the pan. 'Let cool for 20-25 minutes before serving. Serves 4 as a main dish, 6 as a side. 'Reheat the next day at 375 degrees, covered, for 20 minutes.